In addition to the offerings we’ve come to expect from the Rawlings 5150, the 2016 iteration will also contain a hybrid bat in the senior league big barrel market. This two piece 2 3/4 bat will use the same alloy found in the other 2016 5150’s for the barrel, but also add a composite handle on the bat to help dampen sting. We aren’t the only ones to have information about the 5150. Other places, in particular those who sell bats, usually have a boiler plate write up on the specs of a bat. Many of those we reference to make sure we are seeing what we should be. Here are some more references for the 2016 Rawlings 5150 review. While in the cage, we noticed this end loaded, stiff stick doesn’t have much sympathy for your hands on mishits. But, when hit well, the 5150 drills balls into the stratosphere the best we’ve seen under BBCOR standards. Cage time makes it quickly obvious why it is the sole bat responsible for the Virginia Cavaliers winning the 2015 NCAA Colllege World Series (although some Rawlings VELO lovers will have something to say about that). The 5150 is made for hitters who prefer the power that comes from a single piece bat and like hot out of the wrapper sticks. The single piece bat will ring your hands on mishits, but those who can manage that are rewarded with an increased slugging percentage. The added swing weight is also built for hitters who prefer more of a sledge hammer type feel in their bats. 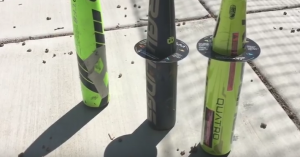 We like the 2016 5150 single piece bat for bigger hitters that hit the ball well. The hybrid version will be interesting to pay attention to this year and is a fun addition to the respected 5150 line. Before last year, the 5150 was considered an end-loaded bat. In 2015 (and 2016) Rawlings added a composite end cap--the same one found on the VELO. This lowered the swing weight of the 5150 dramatically. As a result, many vendors' websites and YouTube videos claim the 5150 is now balanced. But that information isn't particularly helpful considering the Rawlings VELO---which vendors also claim is balanced---has a noticeably lighter swing weight than the 5150. To make it clear, we like to refer to the VELO as having a hand-load while the 5150 is balanced. Hopefully, one day, the nomenclature will catch on. Few bats have more traction in the high performance bat space than the 5150. That's because it has a lot of things going for it. First, it has a great pedigree. Second, it has a nice price point for a high end bat. And third, its reviews, year after year, have always been stellar. The single piece 5150 could be considered an end loaded version of the 2016 Rawlings VELO. Its nearest competitor on the market is probably Louiville Slugger’s 516 Omaha—although the Omaha doesn’t have the extended composite end cap. Another similar bat to the 5150 single piece may be the Mizuno Generations—which also has varying wall thickness along the barrel for better weight distribution. But the Generations is more hand-loaded than the balanced 2016 5150. The new Senior League hybrid 5150 may have a similar competitor in the NVS Vexxum from DeMarini and the 716 Select from Slugger—both of which are also two-piece hybrids with a slight end load. The 5150’s swing weight comes in about 10% heavier than the VELO making it similar, in swing weight, to the Voodoo Raw. Other than that unique senior league big barrel hybrid, the other 2016 Rawlings 5150 will continue to be a single piece of alloy from the handle through the barrel. Like last year’s model, it also has an extended composite end cap covering about two inches of the end of the barrel. While this makes the traditional 5150 a multi-piece bat, it is often referred to as a single piece alloy simply because there is no transition between the handle and barrel to a different material. The 2016 single piece 5150 will come in a BBCOR size as well as a drop 5 and drop 10 in the 2 5/8 big barrel version. It will also have a drop 13 youth barrel (2 1/4) size. The new hybrid will come only in a 2 3/4 drop 10.